Prior to a sold-out show at New York's Bowery Ballroom, Vaden Todd Lewis and Clark Vogeler strummed a few classics for the SPIN.com cameras. When we met up with the Toadies on a Manhattan rooftop yesterday afternoon, we were not alone, forced to conduct our taping under the watchful eyes of Communist leader Vladimir Lenin, a statue of whom adorned our location in Manhattan’s Lower East Side. While Lenin remained, well, stoic, Vaden Todd Lewis and Clark Vogeler shared their wealth with the SPIN.com populace, running through acoustic versions of some of their best-known work. The two-song setlist: a pared-down acoustic rendition of “Backslider,” and “I Come from the Water,” a hook-heavy blues number about amphibianism, or that time when our ancient aquatic selves left the ocean to populate the land. 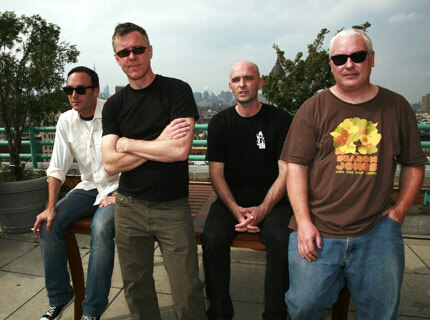 In support of their ongoing reunion and accompanying new album, No Deliverance, which will arrive Aug. 19, the Toadies followed up their private SPIN mini-set with a gig at New York’s Bowery Ballroom to a sold-out crowd. Lewis, Vogeler, and company are set for a full slate of nationwide performances in the coming couple of months, so be sure to see catch them at a city near you, and to enjoy the below clip of their exclusive SPIN serenade. Full tour dates are available at myspace.com/toadies.